Warren Buffett’s MidAmerican Energy Holdings has announced yet another foray into solar energy with the purchase of a 49 percent stake in NRG Energy’s Agua Caliente solar project in Arizona. The announcement comes only a week after MidAmerican’s $2 billion purchase of the Topaz photovoltaic farm in San Luis Obispo County, which marked MidAmerican’s first venture into solar power. 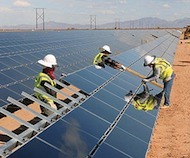 The new 290-megawatt plant will be built by First Solar, which expects to complete installation of its panels by 2014. The plant won a $967 million loan guarantee from the U.S. Energy department, and will provide power to the PG&E Corp. utility under a 25 year contract. Buffett, known for his opportunistic investments in the past, clearly sees some big opportunities in renewable energy. After all, the renewable sector is starving for capital. And with A 25 year contract already in place, the Agua Caliente solar project is an obvious opportunity to generate profit over the long-term. If Buffett’s recent investment decisions reveal anything, it’s that solar power is becoming an increasingly profitable sector for investors – despite the high profile bankruptcies of Solyndra and Evergreen. And with the costs associated with solar power projected to drop over the next few decades, it will perhaps be even more profitable in the future. It will be interesting to see how investors respond to MidAmerican’s recent investment decisions. Will they see it as a “green light” for further investments in renewable power? Do you think that MidAmerican Energy Holdings will continue to invest in solar power? Good to see Obama and Buffet on the same page when it comes to energy. Great minds think alike.